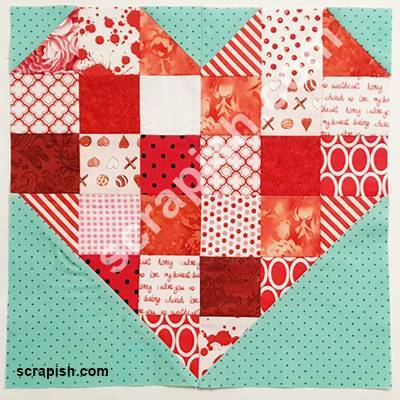 The double hourglass quilt block is super easy to make. Use a strip set, a little math (done for you!) and you can make a quilt that rocks! 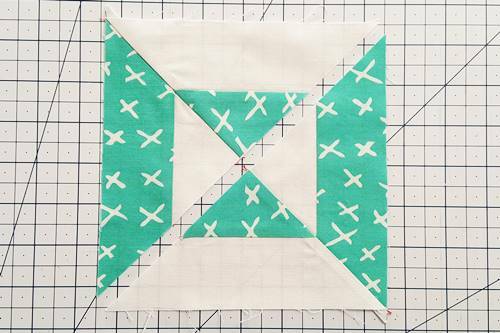 To construct this block we will use a quarter square triangle (QST) ruler and strip sets. Some QST rulers have a blunt tip and some have a pointed tip. 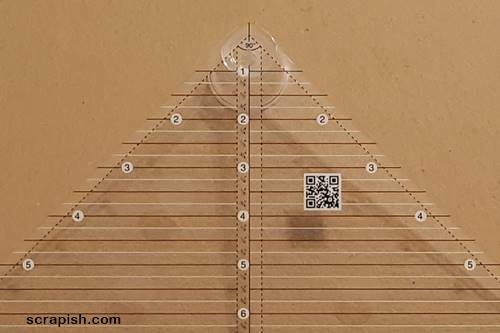 Rulers with a blunt tip have accounted for offsetting the triangles when stitching. 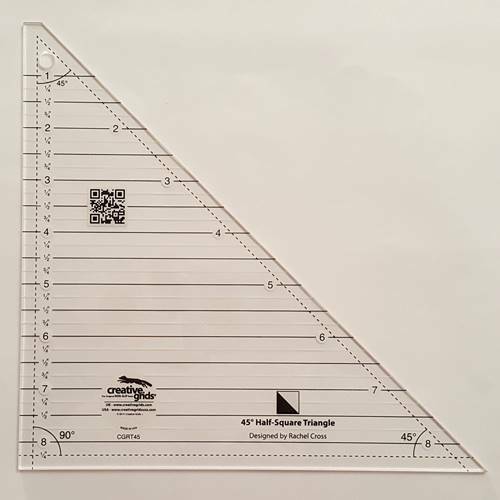 If you use a ruler with a pointed tip you may need to offset the triangles by 1/4 inch. Check the instructions for your ruler. The math and instructions that follow are for use when cutting strips with a blunt tip QST Ruler. A single quarter square triangle (QST) is twice as long as it is wide. It takes 4 QSTs to make a square block. 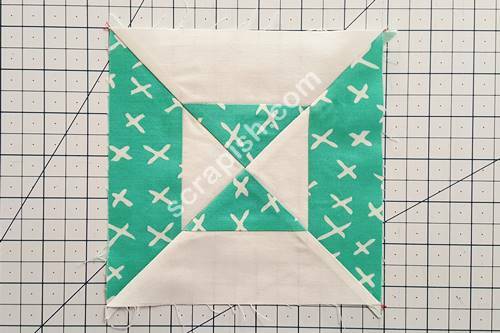 Divide your finished block size in half and add 1/2 inch for the seam allowance. Place the ruler measurement line that corresponds with this measurement along the bottom edge of your strip set. 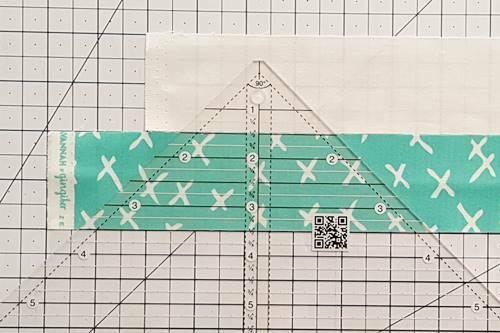 Align the bottom edge of the strip set with the 3 1/2 inch measurement line on your QST ruler (you'll see this in the block instructions). The math for one double hourglass block strip is to divide the finished block size by two. Then, divide that result by two. Add 1/2 inch. Now, cut 2 strips in this size. Here's a chart that includes common sizes for the double hourglass block. The math's done for you! 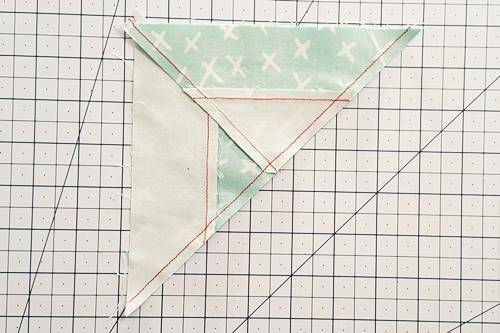 Remember, you are going to cut two strips, one each in Fabric A and Fabric B, to make a strip set. For a 6 inch finished size block, cut 2 (2 inch) strips. Place 3 1/2 inch QST ruler measurement line on bottom edge of strip set. For a 8 inch finished size block, cut 2 (2 1/2 inch) strips. Place 4 1/2 inch QST ruler measurement line on bottom edge of strip set. For a 9 inch finished size block, cut 2 (2 3/4 inch) strips. Place 5 inch QST ruler measurement line on bottom edge of strip set. For a 12 inch finished size block, cut 2 (3 1/2 inch) strips. Place 6 1/2 inch QST ruler measurement line on bottom edge of strip set. Step 1a Make Strip Set Determine the finished size of your hourglass block. 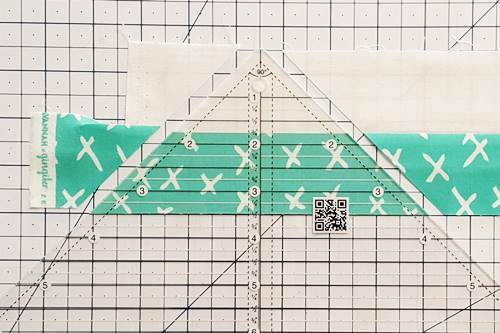 Use the math chart above to determine the size of your strips and cut one each from Fabrics A and B. We are going to stagger the strips of our strip set. With right sides up place the strips next to one another. Align the top strip in from the edge of the bottom strip the same number of inches as your strip is wide. In the case of my 6 inch block that's 2 inches in from the edge of the bottom strip. Why stagger the strips? Depending upon the size the QST being cut and the length of your strips, staggering the strips may enable you to cut an extra QST. 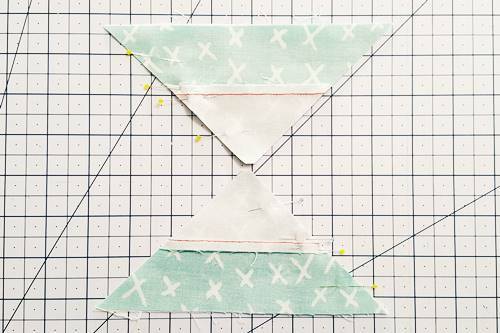 Place the left side of the ruler to the right of the selvage edge (or uneven edge). 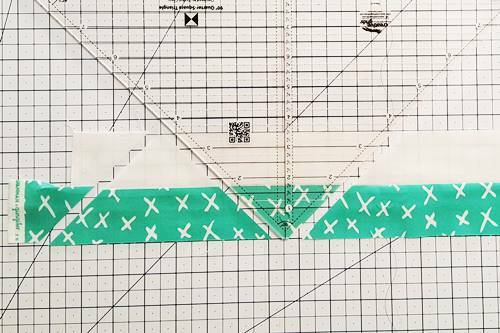 Make any adjustments necessary in the top strip to make sure that the left edge of the ruler is placed on usable fabric (close to the selvage or raw end so as to not waste any usable fabric). (1b) Place the right sides of the strips together and pin. Stitch a 1/4 inch seam along the right side of the strip set. Step 2a Press the seam of the strip set toward the darker fabric. 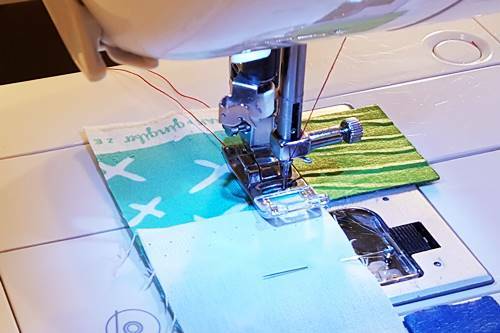 (2b) Place the strip set right side up on your cutting mat. Align the correct measurement line of the quarter square triangle (QST) ruler along the raw edge of the bottom strip. Here, I am making a 6 inch block. So, I placed the 3 1/2 inch measurement line along the bottom edge of the strip set. (2c) Using a rotary cutter, cut the strip along the right and left sides of the ruler, making a QST. Step 3 Now rotate the ruler 180 degrees so that the blunt tip is aligned along the bottom edge of the strip set. 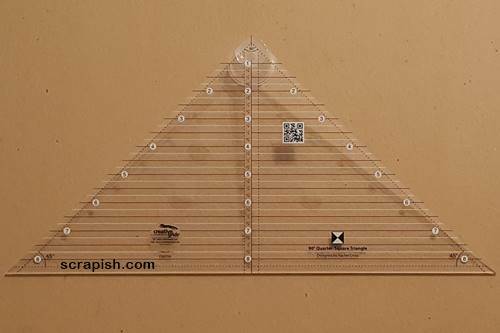 Align the left side of the ruler along the left side of the freshly cut strip set. Make a cut along the right side of the ruler, making a second QST. Step 4 Continue to rotate the ruler 180 degrees and cut QSTs until you have cut all of the QSTs that the strip set will allow. Note: It is hard to get the entire strip set into one photo. 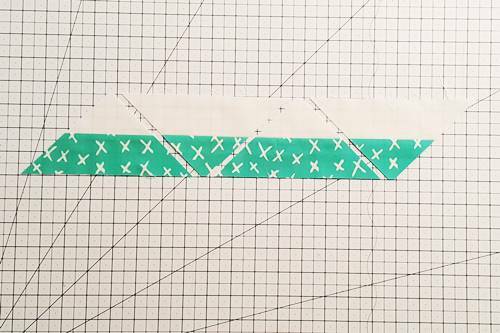 Here you can see multiple quarter square triangles cut from the same strip. 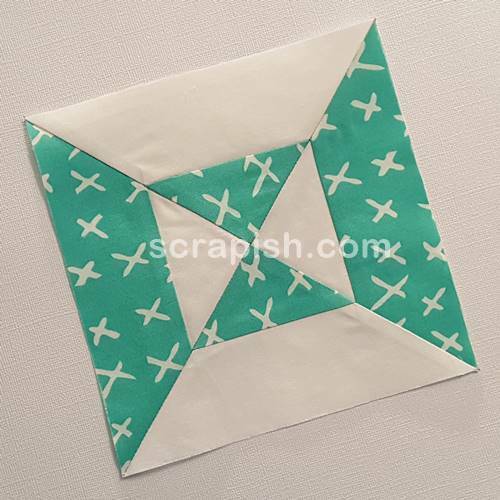 Step 5 Arrange 4 quarter square triangles into a double hourglass quilt block as shown in the photo below. 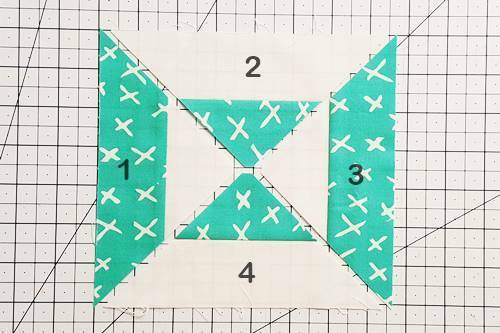 Use 2 QSTs that have the darker fabric in the top strip (numbered 2 and 4). 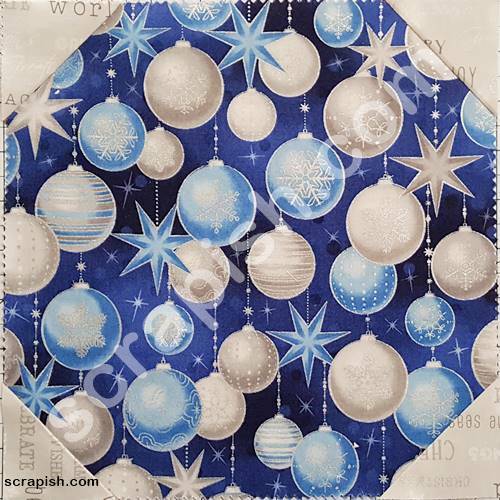 Use 2 QSTs that have the darker fabric in the bottom strip (numbered 1 and 3). Step 6a (From the photo in Step 5 above) Pair QST Number 3, right sides together, with QST Number 4. Pair QST Number 1, right sides together, with QST Number 2. Step 6b With the blunt tip going under the needle first, stitch a 1/4 inch seam. Step 7 Press the seams of each half in opposite directions (usually toward the fabric that is darkest in the center). Step 8 With right sides together align the two halves along their long diagonal edge, nesting the three seams. Stitch a 1/4 inch seam. Step 9 Press the seam to one side. Trim off the dog ears. Your double hourglass quilt block is finished! Beautiful, I love it! 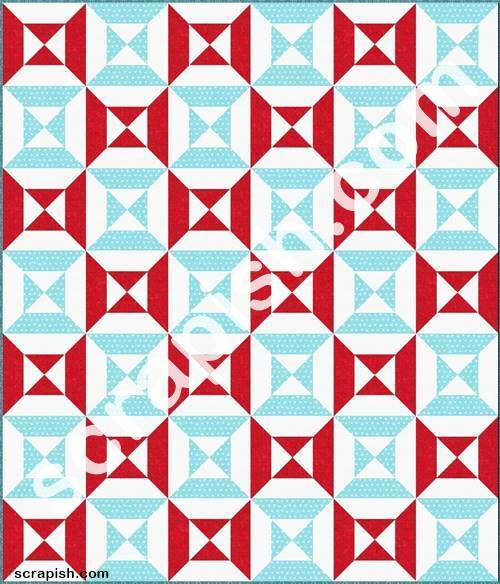 Here's what a quilt would look like with all double hourglass quilt blocks made in two contrasting colors – red and aqua. The binding is done in a darker shade of aqua. I'm in love with this pattern! 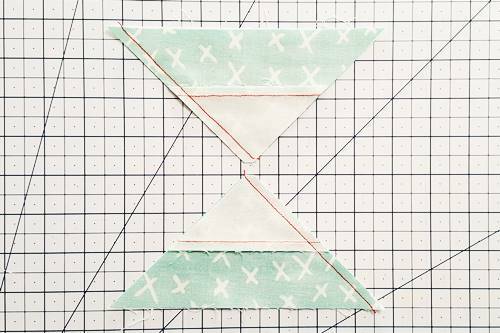 The simple hourglass quilt block and hourglass quilt pattern are similar. Check them out!